life as we share the stories of their dreams and memories, generosity and hard work. Linda Tantillo has been on staff of Rosendale Library for over 15 years. Local History is one of her passions, having worked in the local history collections at Elting Library and the Huguenot Street Library in New Paltz. From the beginning of her work here, she was has been dedicated to building up and sharing the Rosendale Local History Collection. We will celebrate the 60th Anniversary of the Rosendale Library with cake after the lecture. 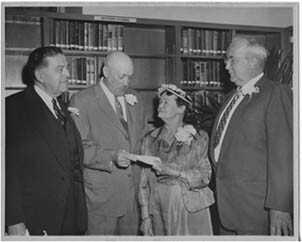 This is a picture of Andrew J. Snyder handing over the deed to All Saints Chapel to Anna Mae Auchmoedy, President of the Rosendale Library Association, on April 13, 1959. They are flanked (l to r) by Frederick Snyder and Edward Huben.